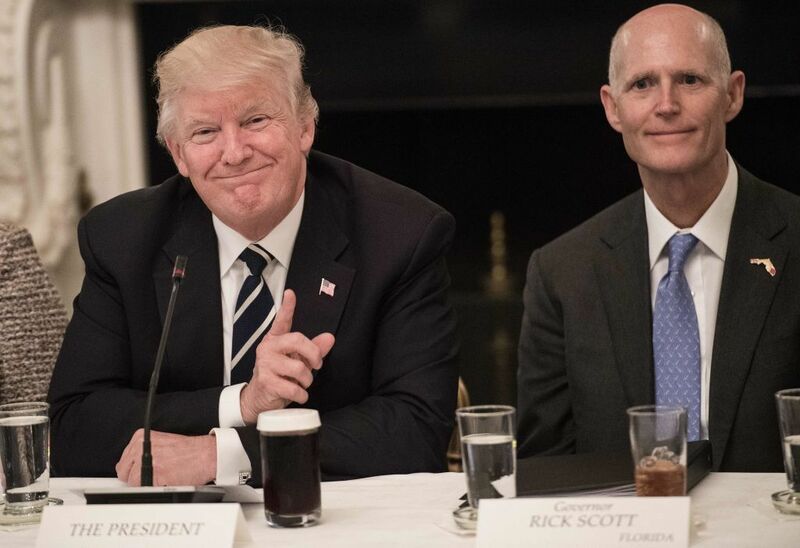 Florida Republican Senator Rick Scott said President Donald Trump may not really believe in his own "sanctuary city" proposal, and is perhaps just floating the idea to "make everybody crazy." The GOP governor-turned-senator appeared on CNN's State of the Union Sunday, where he cast some doubt on the president's proposal to relocate detained immigrants from the southern border with Mexico and to so-called sanctuary cities such as New York, San Francisco and Chicago that have policies against arresting illegal migrants solely for the purpose of deportation. Some lawmakers have called the move "illegal" and have tried to maneuver around his "crazy" proposal to express their opposition to current immigration laws. On Sunday, Scott said Trump — a known lover of cable network news, but particularly Fox News — may have only floated the idea of sending migrants to America's largest cities in order to troll CNN and others for his own entertainment. "I don't know whether it's legal or illegal. I mean, maybe he's just saying this to make everybody crazy. Make everybody talk about it on their shows," Scott told Tapper. "But what I do know is, I've been up there — I've been in the Senate for 90 days, we're not securing our border. We're not enforcing our laws." Scott later told Tapper bluntly, "sanctuary cities are illegal," saying Democrats cannot cherry-pick which immigration laws they follow. Scott's remarks come after the sanctuary city proposal went — in a matter of days —from a twice-rejected proposal to something the White House claimed it was already working on implementing with multiple agencies. The story broke Thursday, when the Washington Post reported that Trump had twice attempted to pressure immigration officials into relocating migrants to sanctuary cities. The relevant agencies rejected the idea, saying it would be costly, that Congress had not allocated any money to cover the expense, that it would make it difficult to later locate and round up migrants for hearings or deportation, and that it might ultimately encourage more immigrants to come to the U.S. The White House's response to the Post story was to characterize it as merely a proposal that was considered but ultimately rejected. However, Trump almost immediately undercut his own staff, when he said on Friday his administration is "strongly looking at" releasing immigrants into sanctuary cities, which undercuts earlier denials from officials within his administration. Trump then went into a days-long Twitter tirade against Democratic mayors of "sanctuary cities" and disingenuously accused members of the "radical left" of suddenly not caring for migrants. "...The Radical Left always seems to have an Open Borders, Open Arms policy – so this should make them very happy!....So interesting to see the Mayor of Oakland and other Sanctuary Cities NOT WANT our currently “detained immigrants” after release due to the ridiculous court ordered 20 day rule. If they don’t want to serve our Nation by taking care of them, why should other cities & towns?" Trump tweeted Friday. "Whether or not it moves forward, that's yet to be determined," she told Fox News Sunday. "This was raised at a staff level initially and pushed back on. The president wants us to explore it again, so that's being done and they're doing a complete and thorough review." Several Republicans have tried to navigate around Trump's illegal "sanctuary city" suggestion, including one of his most staunch defenders, New York Republican Peter King. The GOP congressman claimed on Fox News Sunday he'd prefer another route to Trump's suggestion, but called it a "good bargaining point" to force congressional Democrats to change immigration and asylum laws. “We have people who are routinely coming to this city. We have a whole infrastructure that’s built up to make sure that their rights are protected while the city of Chicago has, under the current administration, provided funding for various groups to help support asylum seekers and other people that are going through the immigration court system. I expect it will continue, if not expand upon, those kinds of resources,” Said Lori Lightfoot, Chicago's mayor-elect, Friday during a CNN interview with Anderson Cooper. "People have come to this country, documented or undocumented, they're hard working and family people, they want a better life," said Philadelphia Mayor Jim Kenney, according to KYW Radio. "They tend to open up businesses and employ other people. If they reverse the decision and send people here, I'd be happy to have them."